One of the things that you do not want to do as host of a barbecue party is to run out of food. It is much better to wind up with leftovers. That said, you do not want to waste food either. When planning how much barbecue per person, you should take a few factors into account. It is possible to serve as many as 30 guests using a single grill without too much trouble. Gender is one of the important factors to consider and age is another. Generally speaking, young men will eat more than everyone else; however, this does vary from group to group. Note also that children typically eat the least of all the age groups so you will want to factor the number of younger guests in as well. You should certainly determine whether there are any people who do not eat meat among your guests. You will have to find meat alternatives for them. Expect a rack of ribs to serve two adults, if ribs will be the only meat or if there are only two or three sides. If you are serving multiple types of meat or more than three sides, expect it to serve three or more. Plan for two chicken pieces per person if chicken is the only item or if you are only serving two or three sides; one per person with other meats and more than three sides. Plan for two burgers per person with two or three sides or other meats. For pulled or sliced meat, a pound should serve three people; 4 people if there are multiple types of meat or more than three sides. Note that this refers to the weight of the cooked meat, not the weight of the raw meat. 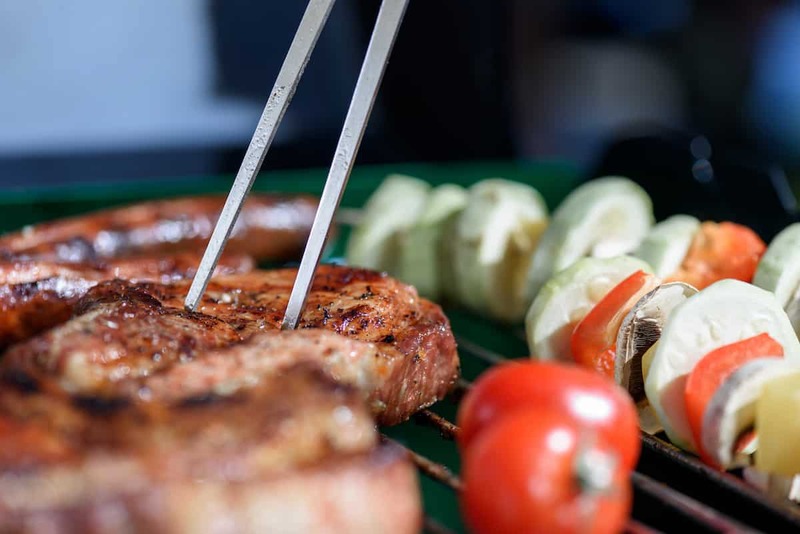 When grilling meat, you have to consider the fact that it will lose a considerable amount of weight after being trimmed and losing water as a part of the cooking process. In some cases, the weight printed on the package and the finished weight can differ dramatically. This means that you need to be conservative with your planning. While ribs and chicken do not lose a large amount of their starting weight, other meats do. With brisket, expect to lose up to 45 to 50 percent of the raw weight. You will get about 10 pounds of cooked brisket for every 20 pounds of raw brisket that you smoke. Burgers made with 80/20 ground beef will usually lose about a third of their starting weight by the time they come off the grill. Pork loin will also lose approximately a third of its starting weight. If you plan to serve boneless cuts, you will need at least 4 ounces per person. Ideally, you should serve each guest about 6 ounces. For bone-in cuts like T-bone steaks, plan for 12 ounces per guest; the ideal serving size will be around 16 ounces.